The Honorable Minister Louis Farrakhan, even at the age of 85 years young, draws crowds like a Rock Star. He is a man that I believe is annointed by Allah (God) to be a divine messenger and warner to the people of America and the world. 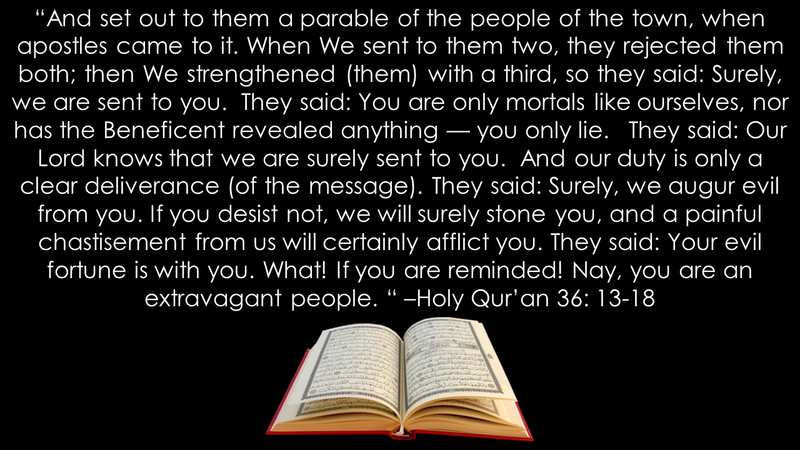 The Holy Qur’an says every nation is given a Messenger from Allah to serve as an expression of His divine mercy upon an errant people. The idea is that if the errant people can lift up their heads in the midst of their deviation and departure from the path of Allah (God), and hear the preaching of the prophet or messenger among them, and follow his instructions, and aid and support his work, they and their nation can be saved-spared from a well-earned doom. Of America, it can be said that she is like unto the place referenced in the 36th Surah of the Qur’an. She is so significant. She is so massive. She is the global leader of all nation-states. She has had not one, but 3 divine servants come to her. The wicked’s painful chastisement or attempt to punish the Honorable Minister Louis Farrakhan during his magnificent 40 year work of rebuilding the Nation of Islam is that he has been branded by various wicked groups as “anti-Semitic”. And politicians, business people, celebrities and world leaders have been threatened that if they have any dealings with Farrakhan, they will suffer. Yet, the more we unravel the charge of anti-Semitism, we see that it has nothing at all to do with a threat of physical violence or harm aimed at the Jewish people. This charge is a political and economic weapon wielded by Jewish watchdog groups at those whose politics snd economics they are at odds with. As the Hon. Min. Louis Farrakhan travels to speak to college and high school students, his trail is dogged by groups like the Southern Poverty Law Center who encourage audiences not to allow the Minister to speak to them. 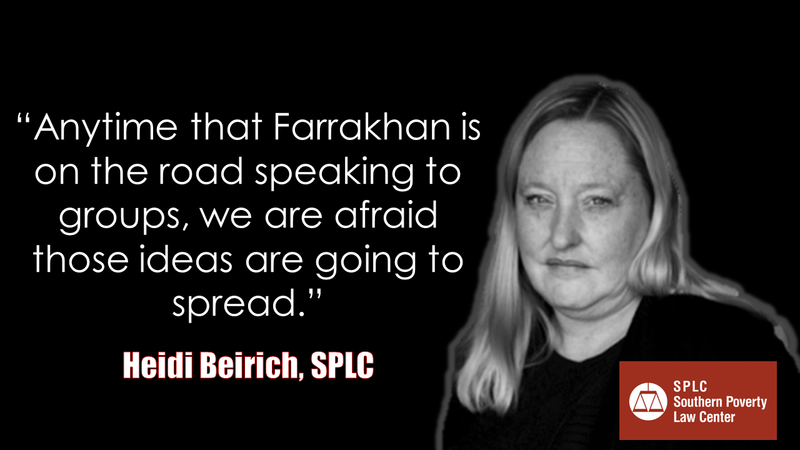 Southern Poverty Law Center (SPLC) researcher Heidi Beirich admitted that what they fear is not any violence that comes from the Minister, but they fear his ideas. This is very telling! It gives us cause to examine and elucidate the ideas that the Minister preaches. It also lets the cat out the bag in terms of the real aim of the anti-Semite smear campaign that targets the Minister. When I became a member of the Nation of Islam, I first heard the Minister in person at an event entitled Stop the Killing. His message was aimed at reducing the crime and violence in the streets of America’s inner-cities. The idea he was promoting was respect for life. 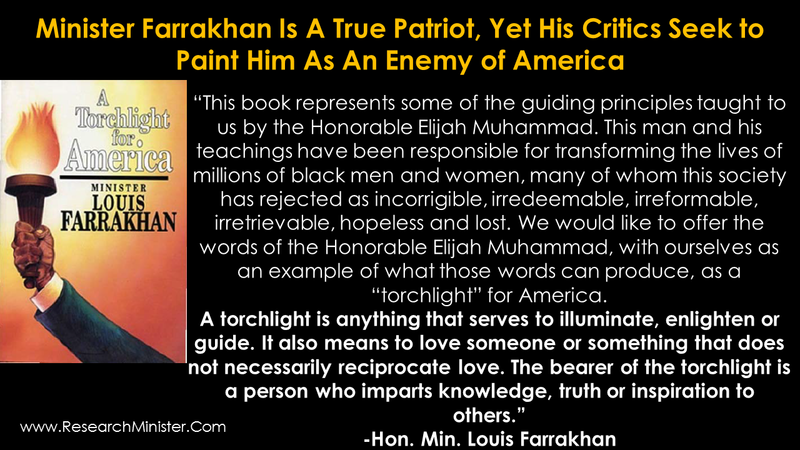 The Minister, in 1993, published a book entitled A Torchlight for America. 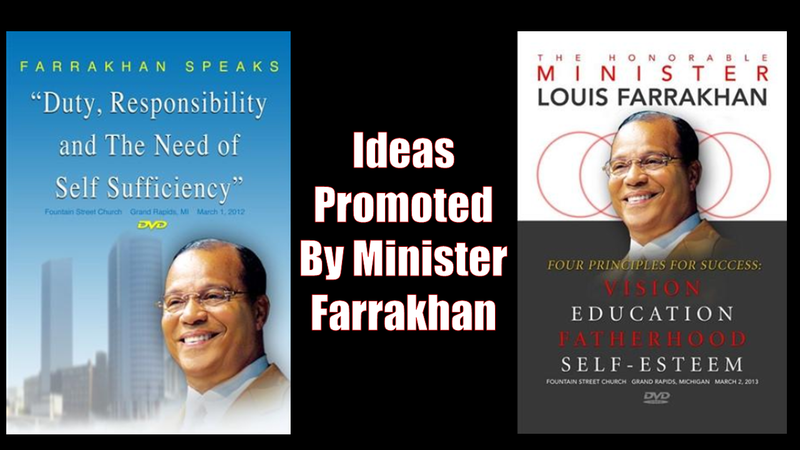 He went into the body of wisdom known as the Life-giving teachings of the Most Honorable Elijah Muhammad and extracted principles of guidance and articulated tangible solutions for America’s spiritual and political leaders. The idea he was promoting was obedience to God is the true security of a nation. The Minister, in 1995, invited a million men to Washington DC for a men’s march and demonstration. Nearly 2 million men showed up for the Million Man March and millions more watched it via satellite around the world. The ideas he was promoting that day were atonement, reconciliation and responsibility. In 1994, Minister Farrakhan spoke to thousands of women in Atlanta, GA for a Women’s Only meeting. He ministered unto women, helping them to see their value to God, the family and the nation. The ideas he was promoting that day was that the abuse of women is wrong and that women are indeed the second self of God; co-Creators with Him. The Minister has spoken to numerous audiences of college students. He spoke in Grand Rapids Michigan 2 years consecutively, delivering 2 major adresses at a very prominent church presided over by Pastor Fred Wooden. The Minister was invited by the Grand Rapids Community College students. The audiences came to listen to the Minister at Grand Rapids’ Fountain Street Church in 2012 and 2013. The Minister was promoting the ideas of Duty, Responsibility, Self Sufficiency, Vision, Education, Fatherhood & Self-Esteem. I could go on and on, but you get the idea. The Minister does not promote any violent ideas that encourage the committing of crime or violence. He is a divine Warner, mighty Messenger, powerful Preacher and an anointed Servant of Allah (God). 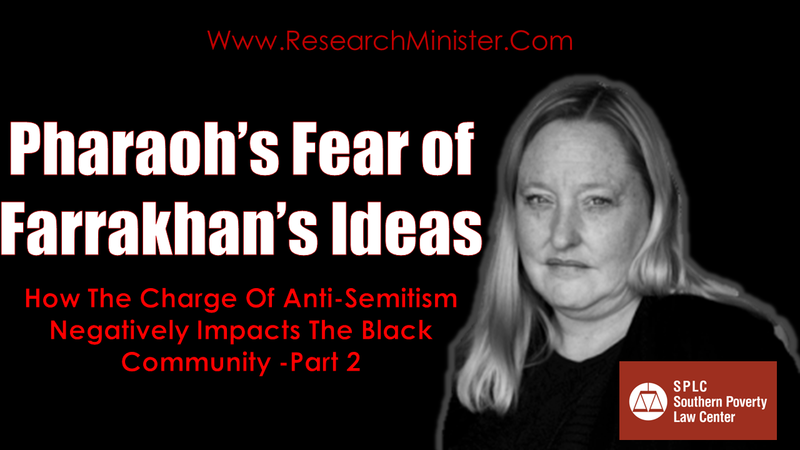 We can see that those who fear the spread of his ideas are those who fear the truth. 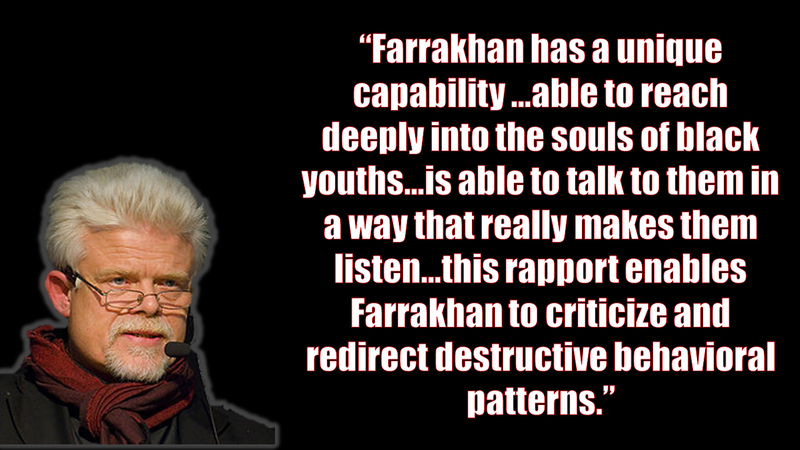 The opposition to Minister Farrakhan is opposition to the overall rise of Black people against all of the various forms and systems of oppression that have been against us in America and all over the world. It should be noted that his critics consider as one of the most problematic ideas that the Minister promotes is the idea that Black people should unite, pool our resources and build an independent society and economic reality of our own. There is in fact, a long history of Black leaders who promote the idea of economic development being falsely labeled as anti-Semitic. 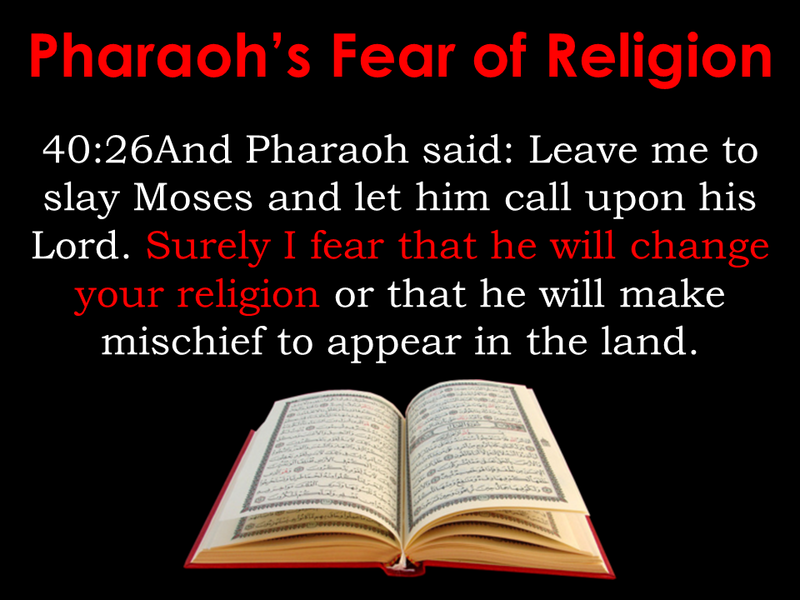 According to the Holy Qur’an, Pharaoh who had enjoyed that the Children of Israel were his slaves and had built treasure cities for him, feared that Moses and Aaron would change the religion of the slaves(Children of Israel). 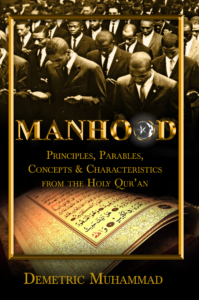 This Quranic narrative is lived out today in the fear of the ideas of Minister Farrakhan, who is like an Aaron promoting the ideas of the Hon. Elijah Muhammad who is like a Moses.